I read five to eight books per month, approximately 2 books per week. Some people doubt that I can make time to read all those books with the kind of schedule that I have- though they say I can barely make time to breathe. But I do spare my time to read, both fiction and non-fiction books (oh, and I also read newspaper every morning to keep up with the rest of the world). Basically, it’s just the matter of time management. I read my books on my way to the office and back (about 1.5hours), while waiting for my breakfast, lunch or dinner, while queuing and before bedtime. I go to the bookstore once or twice in a month to fetch my monthly intakes- mostly well prepared with the list of books that I want to buy. Sometime the bookstore doesn’t have the book that I want so I have to look around to find a substitution. 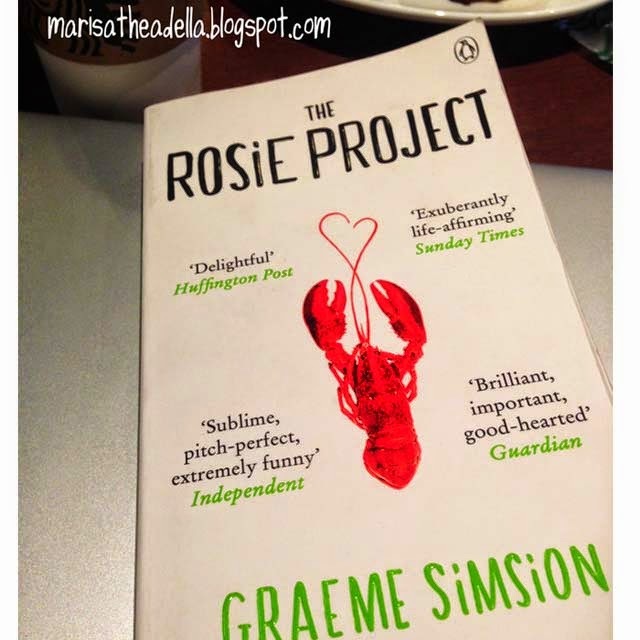 The last book that I picked randomly was “The Rosie Project” by Graeme Simsion. A giant red lobster appears to be the cover of the book with the title lies above, along with some comments regarding the book- please check the picture. I don’t think lobster is an appropriate symbol of the story, like… why lobster? I noticed that they do eat lobster, regularly, but, still…I saw some different covers that relate more to the story, so it doesn’t matter anymore. The book has approximately 327 pages with 36 chapters, excluding the acknowledgement and attachments. I can say that the story is easy to follow, fun and, sort of, romantic. The main characters of the book are Don Tillman and, obviously, Rosie Jarman. Don is a young and good-looking professor with a complex personality, which for me seems like he is having Asperger syndrome. The story begins with Don and his latest experiment called “The Wife Project”. Don has hard time in socializing; he finds it hard to interact with new people and to develop relationship. The problem leads him to remain single at the age of 39. He’s never been into the second date, since all of them ended immediately in the first date. He has only limited number of friends- his sister (passed away), Daphne (sent to the nursing home), Gene, and Claudia. Gene is his professor-friend and Claudia is Gene’s wife- both of them have important roles in the story. Don is not an ugly person; instead he is a smart, stable, decent and a good-looking man. So what is(are) actually his problem(s)? First, he sticks to a very tight schedule every single day (what? That sounds like me!). His schedule contains his activity (complete with the time taken to do it in minutes), his diet (he avoids changing it so then he doesn’t have to spend longer time in trying new recipe or buying new ingredients) and … well, everything. Second, he takes things too literally (that sounds like me, again). He doesn’t take jokes and doesn’t even bother to think twice before he say something- you know, just to consider what others might feel. Third, he sets the bar too high. He makes a questioner (yap, a freaking questioner) for his partner-candidates. I hate that part because I feel like he is objecting woman by doing that. Fourth… oh, the list is endless- simply said, he has personality problems. The first time he met Rosie, he thought that Rosie is one of the “Wife Project” applicant. Rosie is, on the other hand, completely different to the ‘perfect’ partner criteria that Don is looking for. She is totally incompatible. But there’s something in Rosie that triggers Don to do something different; something out of his plan, something out of his boring routines. Despite of walking away from Rosie, Don decided to get involve in Rosie’s personal ambition- finding her biological father. Don’s background as a professor in genetics field has made such a great excuse for him to be in touch with Rosie. To not spoil you the entire process, their journey throughout the “Father Project” has changed both of their feelings. Rosie herself is a complicated woman. She seems to be a feminist, but not really. For almost all of her lifetime, she believes that his father is not her biological father- or at least that’s what her death mother told her. She is afraid to express her feeling, making it even harder for Don. Somehow I feel like she doesn’t put herself in Don’s shoes as well, which is ironic because she is taking her doctoral in psychology. For so many reasons, I think Don gives more efforts in the relationship rather than Rosie. Don tries to be more socialize, fun and stylist in order to be success in his “Rosie Project”. The story ends happily with Don and Rosie being together. This is exactly the ending that I expect after reading through all of Don’s journeys. He deserves a happy life and a good partner. He deserves to be loved. He is a good man- not perfect, but I sense his innocence. As for me, he is just a man with undiagnosed Asperger who is experiencing love. Don character reminds me of a friend of mine and that’s getting personal to me. As I told you before, the story is fun and easy to follow. It will be hard for you to wait what will happen next or what awkward thing Don will do later. He is a very interesting character- Rosie might be described as the person who changes Don from boring to romantic man, but it’s actually Don who is able to learn more about life and accept what he couldn’t accept before. Graeme Simsion uses bunch of scientific words within the story but managed to make it easy enough to understand- like, you won’t feel like you are reading a science textbook or sort of a kind. I like his writing style- manly but not so manly in the same time. I don’t want to be sexist but he knocked the same side, equally. If you are into a romantic, not-too-light story, I think the book is suitable for you.